Background: The name Allen in Ireland is derived from the native Gaelic O'hAillin Sept that was located in County Tipperary. The name was also brought to the country by settlers from England and Scotland in the seventeenth century. Hallinan, Hallion, Alleyn and MacCallion are among the recorded variants. Motto: Fortis et Fidelis, Strong and Faithful. Arms: Or a chev. betw. three bloodhounds upon the scent sa. 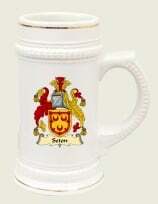 Crest: On a mount vert, paled round or, a hound sa. collared of the last. The most of Allens in Ireland are of English or Scottish origin; but some families of the name who can claim to be Irish. Ó hAillÍn, anglicized as Hallion and Allen, was found in counties Tipperary and Offaly. And Allen has also been used in the neighbourhood of Cashel as a substitute of Hallinan. Many of the English Allens came to Ireland under the Cromwellian regime, but there were earlier immigrants from England, notably Wollsey's creature John Allen or Alen (1476-1534) whose "Register," compiled when he was archbishop of Dublin, is a valuable source of information about mediaeval Ireland he became Lord Chancellor of Ireland and was assassinated by the followers of Lord Thomas FitzGerald. MacAilin is Scottish, being the name of a warlike branch of the Campbells, who were brought to Ulster by the O'Donnells in the sixteenth century. These survive there as MacAllens and Allens today. MacEllin, was a small distinct sept located on the borders of Mayo and Roscommon. The name in various spellings MacEflen, MacAlyan etc.-occurs frequently in the Fiants of the 1580s dealing with that area. Contemporary references to Mac Ailin in the Four Masters are to the galloglass (Campbell) family in Ulster. Another well known Allen in Irish history is probably William Philip Allen (1848-1867), one of the "Manchester Martyrs". Another adherent of the national cause was John Allen (d.1850) who was associated with Robert Emmet in 1803. Name Variations: Allen, Allan, Alain, Allan, Alun, Alyn, Ailean, Ailín. Irish Families, Their Names, Arms & Origins; Edward MacLysaght - 1957. The Surnames of Ireland; Edward MacLynsaght - 1957.